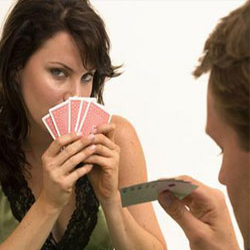 You are at:Home»Tips of the Week»It’s Not a Sin to Get Caught Bluffing! You want to bluff the right people at the right time but no matter how well you plan the bluff sometimes you will get caught. That is okay. If you played the hand correctly and were bluffing then sometimes you will still get your hand caught in the cookie jar. It’s not the worst thing in the world as it lets other players know that you don’t only play with the best hand and that will get you more action which will be just what you want when you do have a big hand. Remember the keys to choosing you moment to bluff – position, the other playing patterns of those still in the hand, still in the hand, (loose or tight) your chips stack, your table image.